Cranberry are a healthy fruit used in pies, cakes, dinners and other foodservice meals. We have been selling Cranberry sauce to restaurants for 40 years. Buy your wholesale Cranberries from the leader in restaurant supply for your cooking creations. Clement Pappas Jellied Cranberry Sauce Can - 16 Oz. General Mills Gold Medal Orange Cranberry Muffin Mix - 5 Lb. Hormel Thick and Easy Drink Cranberry Honey Consistency Control Cups - 4 Oz. Ocean Spray Whole Berry Cranberry Sauce - 14 Oz. Ocean Spray Cranberry Juice Cocktail Drinks 5.5 Oz. Ocean Spray Cranberry Juice Cocktail Drink Tin - 46 Oz. Ocean Spray Jellied Cranberry Sauce Resealable Plastic - 101 Oz. Ocean Spray No Thaw Cranberry Juice Cocktail - 4 Oz. Ocean Spray Jellied Cranberry Sauce - 14 Oz. Ocean Spray Jellied Cranberry Sauce - 117 Oz. Ocean Spray Whole Berry Cranberry Sauce - 117 Oz. Ocean Spray Whole Berry Cranberry Sauce - 101 Oz. Portion Pac Ocean Spray Cranberry Sauce - 0.5 Oz. Craisins Original Sweetened Dried Cranberries - 6 Oz. Sweetened Dried Cranberry Craisins - 10 Lb. Cranberry Sauce - 12 Grm. Craisins Clusters Cranberry Almond - 2 Oz. Craisins Dried Cranberries Orange Flavor- 1.16 Oz. Craisins Dried Cranberries Greek Yogurt - 3 Oz. Craisins Dried Cranberries Milk Chocolate- 3 Oz. Cranberry Flavor Label - 1.25 in. x 2 in. Orange Cranberry Flavor Label - 1.25 in. x 2 in. Craisins Dried Cranberries Watermelon - 1.6 Oz. Craisins Original Dried Cranberries - 48 oz. Soft and Moist Sweet Dried Cranberry - 25 lb. Nestle Vitality Cranberry 10 Percentage Ambient Concentrate - 1.05 Gal. Tru Fru Whole Cranberries Dark Chocolate - 3.2 Oz. 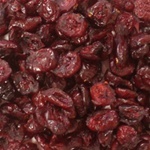 Cranberries Ripe and Ready Dried Fruit - 4 Oz. Restaurant Dried Cranberries are used for cooking in fine dining restaurants and for certain desserts.